The population maps focus on current patterns of the settlement and demographic situation in the Baikal basin. They relate to a complex of underlying social, economic and ecological factors. The population maps of the Baikal basin are based on the statistical data of the Federal State Statistics Service of the Russian Federation and National Statistical Office of Mongolia. Also important were the data from population censuses of Russia and Mongolia and the data of the current measurements of demographic events. The authors used statistical sources to calculate indicators for territories included into the Baikal basin. The distribution of settlements within the Baikal basin is quite irregular. There are four locations of the regional concentration of the population. In Irkutsk oblast, the main settlement belt along the Trans-Siberian Railway stretches from the western border of the region up to Lake Baikal. Here, there are many agricultural settlements and the majority of large administrative and economic centers, where manufacturing sector dominates the economy. Irkutsk – a large multi-functional center – tops the group of these settlements. Only sparsely populated the Olkhon and Slyudyanka districts and part of the Irkutsk district fully lie within the Baikal basin. In the direct vicinity of Lake Baikal, but in the Angara basin, there are cities of Irkutsk and Shelekhov. In the Republic of Buryatia, there is a major settlement area around Ulan-Ude with a maximum concentration to the south of the city. Geographic differences in the specialization of settlements have emerged. Settlements involved in manufacturing and transportation are overwhelmingly dominant along the Trans-Siberian Railway. In Southern Buryatia, there are mostly agricultural settlements. In Zabaikalsky krai, there are three settlement networks: settlements involved in manufacturing and transportation located along the railway; mining settlements near deposits; and agricultural settlements located south of Chita in the forest-steppe and steppe zone. In Mongolia, the population is mainly concentrated in the central region – from Ulaanbaatar in the south to Sukhbaatar in the north. Three largest cities of the country and more than a half of its population are located in this area. The other territories of the Mongolian part of the Baikal basin are sparsely populated. Distribution of the population and the degree of the settlement of the territory are displayed on the maps “Density of population (as of 1.1.2013)”; “Density of rural population and population size of urban settlements (as of 1.1.1989)”; “Density of rural population and population size of urban settlements (as of 1.1.2013)”. The Baikal region belongs to sparsely and unevenly populated territories. The population density of the Baikal basin is 17 times lower than the world’s average of 53 persons/km2. The population density in the Russian part of the basin is 2.9 persons/km2, which is nine times lower than in the European part of Russia (26 persons/km2). The intra-regional differentiation of settlement patterns is stipulated by several spatial gradients of the population density decrease, with the main gradient leading from the center (capitals and administrative centers) to the periphery. Other gradients are also present in particular territories. Thus, in the Russian part of the basin, the population density tends to decrease as it goes from the south to the north and from the west to the east. The Russian-Mongolian border for the most part rather separates than unites the areas of settlement, except for one direction. The core of this direction is the Selenga Valley, where an area with a highly dense population has formed between Ulaanbaatar and Ulan-Ude. The territories around large cities, like the regional centers Irkutsk, Ulan-Ude and Chita, are most densely populated. Along with the areas with dense population, there are also virtually unpopulated territories of tens of thousands square kilometers in area. The distribution of rural population is less contrasting than the urban one. The main clusters of rural population are located in the forest-steppe and steppe zones, where the density of population may reach 10-20 persons/km2. Rural population is mainly concentrated in the south of Irkutsk oblast (around Irkutsk) and in the central part of Buryatia (south of Ulan-Ude). The major cities of the Russian part of the basin grew along the transportation lines. Thus, 11 out of 13 towns are located along the railways. Only Zakamensk and Kyakhta are located away from the railroad. In the Mongolian part of the basin, the connection of urban settlements to transportation lines is less pronounced with only five out of 12 towns being situated on the railways. The map “Dynamics of the population size (1989-2013)” shows considerable changes in the population size – a situation, where a high concentration of the population in a few largest centers is followed by depopulation of vast territories. In the Russian part of the basin, there were two clear patterns of the population size dynamics from 1989 to 2013. Firstly, the decrease of population tends to be more pronounced from the southwest to the northeast. Secondly, the population dynamics in regional centers (Irkutsk, Ulan-Ude, and Chita) and their suburbs is relatively positive. 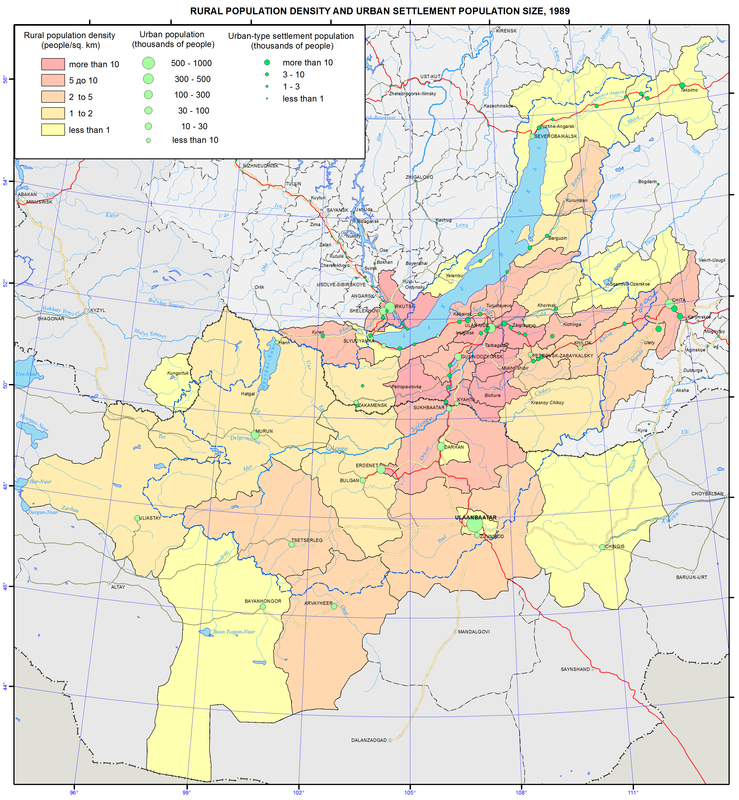 Population growth is observed only in the Irkutsk, Shelekhov, and Olkhon districts of Irkutsk oblast, Ivolga district of the Republic of Buryatia and Chita district of Zabaikalsky krai. The record level growth of population (over 160 %) was recorded in the suburban Ivolginsky and Irkutsk districts. The biggest drop in the population takes place in the localities that are classified as districts of the Far North, with the Muisky and Severobaikalsky districts of the Republic of Buryatia loosing over half of their population. In the Mongolian part of the Baikal basin, population growth is registered on over a half of the nation’s territory. The main Mongolian cities – Ulaanbaatar, the capital of Mongolia, (244 % to the level of 1989), Erdenet, and Darkhan are the fastest growing cities. The Khovsgol and Selenga aimags also demonstrate a significant growth of population. The population in the four aimags of Arkhangai, Zavkhan, Tov, and Khentei decreases due to an outward migration of residents. – The Mongolian part is characterized by the type of the population dynamics, where a natural increase of population prevails over inward migration. Territorial specifics of demographic development are shown on the map “Natural increase of population”. In the Baikal basin, different modes of reproduction of population exist along with a wide variety of quantitative parameters of demographic processes. In general, it is possible to identify two types of population reproduction. Thus, all of Mongolia, Tuva and part of Buryatia are characterized by an expanded type of reproduction with high birth rates, average mortality, and a significant natural growth. The Baikal region of Irkutsk oblast, Zabaikalsky krai, and most of Buryatia is characterized by a narrow type of reproduction with low birth rates, high mortality, and a natural population decline or insignificant natural growth. The annual natural growth of the population in Mongolian aimags is 17-19%. In the Russian part of the basin, natural movement of the population led to mixed results, where 23 municipalities showed population increase, while 10 municipalities had natural decline. With an average natural population increase of 1.4 per mille, there were significant variations – from the decline ranging from -5 to -6% (in the Petrovsk-Zabaikalsky, Irkutsk and Olkhon districts) to the increase exceeding 10 pro mille (10.4% in the Dzhida district, 12.1% in the Kizhinga District, and 16.0% in the Tere-Khol district). The natural population increase in the Mongolian capital Ulaanbaatar was 17.2%, while the increase in the Russian regional centers Ulan-Ude and Chita was 4.3% and 3.4%, respectively, with the decline of -2.7 % in Irkutsk. The map “Urbanization of the territory” shows the proportion of urban population in Russian municipal districts and Mongolian aimags. The share of urban population exceeds 74% of the entire population and is composed of a few territories. The level of the urbanization of the population exceeds the world’s average (51%) by nearly one and half times, however, the level of the urbanization of the territory is low. Urban territories mainly include settlements located along the railways, as well as densely populated administrative centers. In the Mongolian part of the Baikal basin, only Ulaanbaatar and the Orkhon and Darkhan-uul aimags are highly urbanized, while the remaining nine aimags have only a small share of urban population (17.5%-34.9 %). In Mongolia, administrative centers of every aimag must be urban settlements. However, in Russia, the legislation does not mandate municipalities to have urban settlements. Therefore, in the Russian part of the basin, as of 2013, 14 districts did not have urban population at all. Some settlements (Barguzin, Ivolginsk, Kyren, and Khorinsk) rejected their urban status in the process of municipal reforms of the 2000s. The population of Mongolian towns within the basin nearly doubled in 1989-2013, with the population of Ulaanbaatar growing from 540.6 to 1,318.1 thousand people. The population of the largest cities in the Russian part of the basin did not change that much: in Irkutsk, it grew from 572.4 to 606.1 thousand people, in Ulan-Ude – from 352.5 to 416.1, while in Chita it declined from 365.8 to 331.3 thousand people. The main results of migration processes in 2010-2012 are shown on the map “Migratory increase of population”. In Russia, including the Baikal basin, the last two decades witnessed a significant decrease of migration activity of the population. However, outward migration from the region remains high and reproduces almost annually from the mid-1990s up to now. Population movement has mostly become intra-regional – the intra-regional migration turnover makes about 2/3 of relocations in the Baikal basin. The intra-Russian interregional migration causes migration losses, while migratory relationships with the CIS countries contribute to a considerable growth of population. Redistribution of the population between the constituent parts of the Baikal region is intensive including some tens of thousands people annually. In 2010-2012, on average 66.5 thousand people arrived, and 58.6 thousand left. In the Baikal region, the average annual migration increment was 7.9 thousand people. However, it was due to the growth in the attractive for migrants cities of Irkutsk and the Irkutsk district (+9.3 thousand people), Ulan-Ude (+3.4 thousand people) and Chita (+2.9 thousand people). The total growth of the population in these cities was 15.6 thousand people. The rest of the region experienced the outflow of residents totaling 7.7 thousand people. Migration redistribution leads to the growth of the population in regional centers and their suburbs. Only 10 municipalities had a migratory growth, while the rest 24 showed a decline. The intensity of migrant arrivals is highest (twice as high as average) in the suburban Irkutsk and Ivolginsky districts, while the intensity of departures is highest (twice as high as average) in the undeveloped Dzhida, Kizhinga and Muisky districts. Against this backdrop, the Russian part of the Baikal basin has two migration poles – the Irkutsk and Dzhida districts, where an average annual migration balance is +47.4% and -46.0%, accordingly. In general, the majority of territories is characterized by a progressive outward migration, which is compounded by unfavorable structural features of the outflow (with young and educated groups of people leaving the region). The results of migration movement are clearly expressed in terms of the center-periphery relationship: there are three areas of migration growth in the Russian part of the basin (Irkutsk, Ulan-Ude, and Chita with their suburban districts) and one in the Mongolian part, which combines the capital Ulaanbaatar and the aimags lying to the north of it – Selenge, Orkhon, and Darkhan.